SEATTLE, Wash. January 11, 2016 - Seven organizations announced the formation of the Eastside Greenway Alliance this weekend at the 2016 Eastside Rail Corridor Summit. Eastside Greenway Alliance organizations include Cascade Bicycle Club, The Trust for Public Land, Transportation Choices Coalition (TCC), Forterra, Futurewise, Mountains to Sound Greenway Trust and Washington Trails Association. Eastside Greenway Alliance aims to build a new way to move, connect and live on the Eastside through strong collaboration with corridor owners, stakeholders and other local partners. “The Eastside Rail Corridor is more than just a trail; it can become a linear park system, like many of the great urban trails across the country," said Trust for Public Land Washington State Director Paul Kundtz. "The ERC will provide recreation opportunities for pedestrians and bicyclists, an alternative transportation route, a means to reduce carbon emission by getting people out of their cars, and a connection for communities and people." As the Eastside population continues to grow and attract talented professionals, the Eastside Rail Corridor becomes a critical component to improving the economic, mobility and quality of life opportunities for residents of the region. Eastside Greenway Alliance’s goals include building community support, bringing expertise to the development project and bringing together nonprofits to align work and develop strategy under a common vision to advance the development of the corridor. "The Eastside Rail Corridor is integral to creating the healthy, livable communities that all of Washington deserves," said Futurewise Executive Director Hilary Franz. "Futurewise is excited to be a part of the Eastside Greenway Alliance." The Eastside Rail Corridor is a former 42-mile rail corridor extending from Renton to Snohomish. 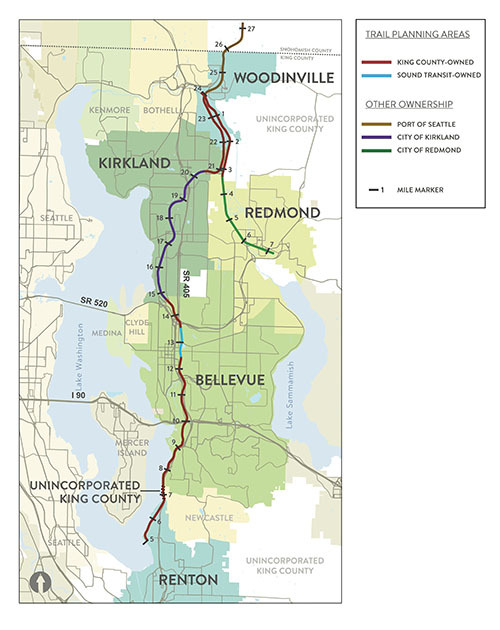 Kirkland and Redmond have built sections of multi-use trail through segments of the corridor, and the rest of the region is pushing for connections to the north and south of these community assets. Two months ago the Metropolitan King County Council unanimously approved the removal of rails through King County owned sections of the corridor, further emphasizing political support, enthusiasm and urgency to move this regional multi-use development project forward. The King County sections will be open for pedestrian and bicycle use after the rail is removed. "Transportation Choices Coalition is happy to be part of the Eastside Greenway Alliance, and especially wants to make sure the design of the corridor makes sense for the community and preserves all uses for the corridor," said TCC Executive Director Shefali Ranganathan. Saturday’s Eastside Rail Corridor Summit at the Meydenbauer Center in Bellevue was a chance for community advocates, business owners, residents and nonprofit organizations to come together to realize the multi-use vision of the corridor. The event, hosted by King County's Regional Advisory Council as well as The Trust For Public Land and Cascade Bicycle Club, was Eastside Greenway Alliance’s first official step as an alliance. Attendees were able to learn what’s been done already, what’s planned and how they can impact the future of the public asset. Attendees were also able to learn what other national, regional and community leaders have learned in planning and building multi-use corridors. On Friday the King County Rail Removal Commemoration and Cascade-hosted ride on the Cross Kirkland Corridor celebrated the progress and share the enthusiasm for corridor development. 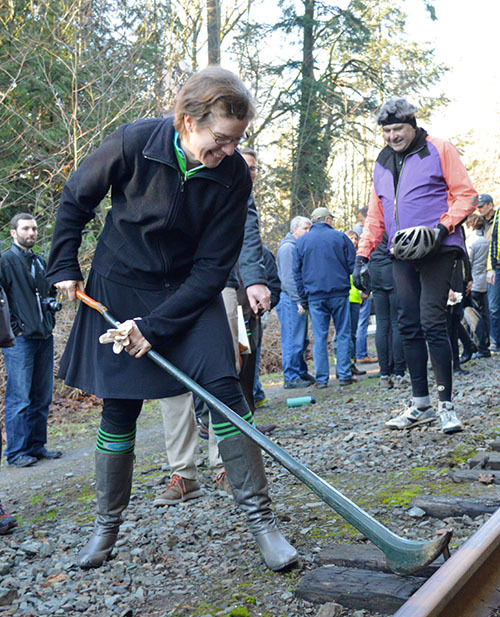 "The Eastside Rail Corridor is a valuable asset that can act as a front door to connecting people to the region's great hiking trails,” said Washington Trails Association Executive Director Karen Daubert. "Completing the Eastside Rail Corridor is a key component of our 100-year Cascade Agenda, and Forterra is glad to be a key partner in the Eastside Greenway Alliance," said Forterra President Gene Duvernoy. By 2025, the Eastside Greenway Alliance envisions a fully built connected multi-use corridor from Renton to Woodinville. All organizations participating in the Eastside Greenway Alliance will dedicate time and resources to move forward with the goal of a multi-use corridor that will provide the greater Eastside community with wide ranging benefits from improved mobility and public health to economic development and a decreased carbon footprint. Through community engagement, fundraising and advocacy, the Eastside Greenway Alliance will advance the multi-use development of the Eastside Rail Corridor.